Milk and Blood is a brand new theatre collective drawn predominantly from graduates of East 15 Acting School and The Dip is its debut production. Author Eifion Ap Cadno has created this piece of absurdist theatre about a bromance which, fuelled by beer and weed, moves to the next level. It takes a while to adjust to Cadno’s freakish world, haunted by sexually aggressive fish and baba ganoush, but stepping away from its boozy, late-night audience reaction you can appreciate the sheer madness of the work. 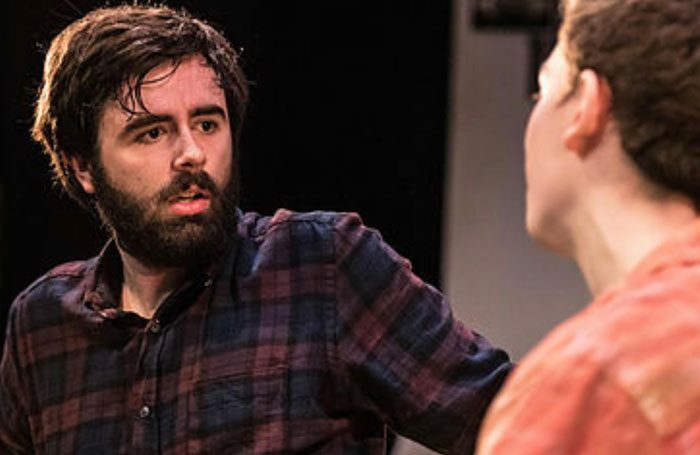 Lewis Carroll is a touchstone here but Cadno’s Alice is the bearded, affectionate Al played by William Patrick Harrison, struggling to address his feelings for his best mate Nic. Al’s personal rabbit hole sees him arrested by a fish and then released only to become embroiled in a wedding ceremony where he is the reluctant groom. Mayhem ensues, but of course there is a lesson to be learned about facing your fears and – chiming with the Fringe motto this year – leaping into the unknown. In what could be described as gig-comedy, the barely controlled chaos is accompanied by live music. Undisciplined, perhaps, but ripe with possibility, Milk and Blood has managed to nail the difficult late-night slot.